Land of Israel activist Itamar Ben-Gvir was recently offered an opportunity many would love to have a guaranteed spot on the next season of the popular reality TV show Big Brother. However, he has turned it down in favor of Sabbath observance and modesty. Ben-Gvir had been prepared to join the show in order to gain a platform from which to share his views on the land of Israel and Israeli politics. He was even prepared to take time off from his regular job, as a spokesman for MK Michael Ben-Ari. However, he insisted on several measures aimed at allowing him to maintain his level of religious observance within the Big Brother house: Sabbath observance, a private room in which he could stay on the Sabbath without being filmed, the ability to pray with a minyan (prayer quorum of ten men) three times a day, and kosher food. He also requested that the show maintain a certain level of modesty in order to allow more traditional sectors of Israeli society to watch without having their sensibilities offended. He told producers that he was not trying to force the show to follow his beliefs, but rather, since producers had expressed interest in a nationalist and religious character on the show, to provide some balance. Producers said they could not meet his religious needs, and Ben-Gvir declined the space offered him. Entering the Big Brother house would have been the kind of opportunity that it is not easy to miss out on, given that I was planning to spread my message and share my truth, Ben-Gvir said. But there are red lines that I cannot cross. I hope the people at Big Brother will come to understand that they must balance the program… I also very much hope that the producers will realize that the program much become a program that broader segments of the Israeli people can watch and maybe even participate in, he added. Producers told him they were interested in having a right-wing voice in the house, after previous seasons featured participants with far-left political views, Ben-Gvir said. 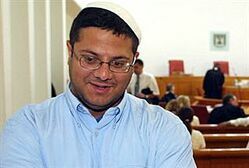 Ben-Gvir has been a long-time activist for Jewish settlement in Judea and Samaria and for a strong response to Palestinian Authority terrorism. He is well-known for holding Zionist parades in Israeli Arab cities, and due to his several run-ins with police, many of which have ended in legal victories.